Thom Conboy at BYS is certainly on a roll as he tells me he's now taken over the central listing for sale of the 36.6m superyacht Chosen One. 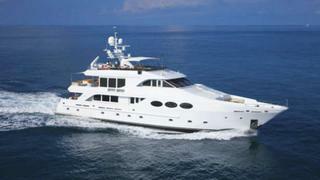 Chosen One, a trideck motor yacht, was built by Intermarine in 2002 and refitted in 2012. She features a refined and comfortable contemporary design emphasizing open space areas. Accommodation is for eight guests in a master suite, VIP stateroom and two double cabins while twin 1800hp MTU engines give her a cruising speed of 12 knots. Thom points out that he's in the unique position of listing a yacht he built when he was CEO of Intermarine. Lying in Fort Lauderdale, Florida Chosen One is asking $6.2 million.